If you went out to find an AV receiver for your needs, you will indeed be overwhelmed with the sheer number of choices you have. Probably you began the journey thinking it would be an easy task – just check out the number of channels and features you need, make a choice among a few options and make a purchase – that’s it! But, in practice – it isn’t as easy as it would appear. There are several options you have and a few with some technical jargons that would do nothing but misleading you and a plethora of features that would leave you spellbound. 4 What Does an AV Receiver Do? That is precisely why we thought of compiling a few formidable options you can give a try to. Well, we would just want to be your helping guide in your journey to find the best AVR you can buy in. Well, we already mentioned that you are spoiled for choice when it comes to the best AVR options for your home theatre. However, there are a few features that you would take care of while buying your favourite AVR so that you would end up getting the best in class functionality. This is an important criterion and the one audiophiles are most interested in. Most of the modern day AVR systems support 5.1 and 7.1 channel AVRs. In fact, these two are the most commonly used layouts. In case, you are looking for high end 9.1 or 11.1 systems, you have the choices available, but we would consider a 5.1 or 7.1 system should be most suitable. The number of connections would be dependent upon the number of equipment and the type of connectivity they come with. HDMI being one of the most common input methods these days, you should have enough number of HDMI ports depending upon your devices. Of course, other connection types like USB and AV ports would also be important and solely be dependent on the equipment you have. Most of the AVRs these days come network enabled. However, it would be worthwhile to analyse whether you really need it. Most common network connectivity is offered through WIFI and Ethernet. You can check out other options like Bluetooth, AirPlay and Chromecast support. However, opt for them only if you really use them. You can save a few bucks without them. This is another area that needs special attention. Some media like Blu-Ray discs come with multiple audio and surround sound formats – notable among them being Dolby ATMOS and DTS-X. Your choice of AVR should be dependent upon which surround formats you would need. This will again be dependent on the equipment you would be connecting to your AVR. Well, manufacturers and advertisers are quite experts in fooling and misleading the potential customer. If you are confused between an amplifier and an AV receiver, we thought of helping you out in making a learned decision. So, before you can move ahead to get yourself your favourite pair of AV receivers, why not get yourself acquainted with the information on how do these two differ between them? An amplifier will basically amplify the sound. A sound source feeds in the sound signal into it and the amplifiers enhance the sound quality and output it through the external or built-in speakers. An AV receiver, on the other hand, can receive both audio and video signals. It can control the input fed into it and change it to different formats depending upon displays and speakers. The amplifier has one single basic function to amplify the sound signals. It will enhance the sound signals and produce stronger output. The AV receiver does come with a similar feature of enhancing the boosting the audio signals and outputting a stronger output. However, there is additional functionality that it comes with – taking in the video signal and then output it to the video display. The major purpose of using the AV receiver would be to feed in multiple sources of video into a single TV or another video source. The ability to handle the video signals is the major difference between an amplifier and an AV receiver. With the knowledge about what to look for in an AVR, we will now check out a few select AVR options you can give a thought to. Without going into much ado, we will list out the best AV receivers you can find meeting your requirements in. 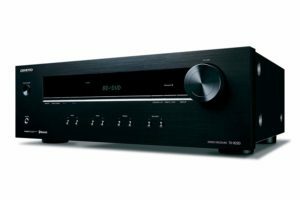 The Onkyo TX-8220 2 Channel Stereo Receiver with Bluetooth is the best you can go with if you are interested in the basics of the best AVR. The two-channel amplifier is best suited for a starter and offers a continuous power output of 45 W/Ch. The AVR also features an AM/FM tuner with 40 preset stations and a CD input. The connections available include one digital optical and one digital coaxial options. You will also get a couple of analogue audio inputs for a CD player or cassette recorder/player. You have access to a larger display providing status info and a larger master control. It comes with Bluetooth alone in terms of connectivity options and other advanced features like WiFi or Ethernet are not provided. The AM/FM tuner with 40 stations preset. The capacitors provide optimum performance without distortion. It serves as the discrete amplifier. There are sound issues if it does not meet the power requirements. Q: Which frequency range does it support? Q: What is the maximum speaker capacity supported? The Denon X Series AVR-X540BT 5.2 Channel Full 4K Ultra HD AV Receiver is a high-end performer with advanced features making it an excellent choice in every right. What makes it a formidable choice is the host of advanced features like 4K compatibility, HDR and ARC. With an excellent 5.1 channel system, it offers you a maximum rated power of 130 watts per channel. The outstanding 5 HDMI inputs, it should indeed be the best you can go with for the video functionality. The built-in Bluetooth compatibility offers you the ability to stream any content seamlessly over Bluetooth. Compatibility with HEOS link provides a streamlined option for hundreds of online music sources. WiFi cannot be used to stream music to the receiver. Q: How many subwoofers can you connect to it? Q: Does it support Dolby ATMOS? The Yamaha 1840 Home Theatre 5.1 channel AV receiver is the ultimate option for those looking ahead for a truly 5.1 channel surround sound performance. The kit is available with six speakers and thus should be the complete package for all your needs. Offering a maximum of 135 Watts per channel power at 6 Ohms, the Yamaha 1840 Home Theatre 5.1 AVR has four HDMI inputs and one HDMI output. You tend to get the best in class HDR support as well. Support for Dolby audio, DTS -X and Cinema DPS should provide you with an excellent functionality at its core. Compressed music enhancer option that revisits the lost effects if any in a compressed music. Q: Can a subwoofer be added? A: Yes, you can add an active subwoofer, but the package comes with a passive subwoofer. Q: Does it have USB connectivity? A: No, it does not offer any USB connectivity. The Marantz NR1608 is one of the excellent options in the realm of AV receivers, but what made us include it in this list is its compact size. If you are someone who is constrained for space, this would be your best bet. The 7.2 channel system comes with a power capacity of 50 watts per channel. You have an excellent collection of eight HDMI inputs that should meet almost all your connectivity requirements. A few other features that would make it a formidable choice include DTS virtual ready, HDR and Dolby vision compatibility. The AV receiver is compatible with AirPlay and offers HEOS link functionality for hours of online music streaming. Though it works with Alexa, fails to understand your commands at times. Q: Internet radio available on the receiver? Q: How can I add Chromecast device to the receiver? The Denon AVRS730H 7.2 Channel AV Receiver should be an ideal option if you are just a beginner in the realm of high end AV receivers. Of course, it isn’t something affordable – but still has been included in this list because of the simplicity it offers both in terms of ease of use and setting it up. Offering a power capacity of 75 Watts at 8 Ohms per channel, it supports 4K and HDR 10. The support for Dolby Atmos and DTS-X should make it an excellent option for the object oriented sound performance. Featuring six HDMI inputs and one HDMI output, it should help you connect with almost all your equipment with ease. The connectivity options available on the receiver are indeed plentiful. Some of them include Bluetooth, Wi-Fi, AirPlay, and the ability to stream from DLNA servers. Q: Does it support HEOS online streaming? Q: Does it have Alexa? A: Yes. In fact, it can be totally controlled by Alexa. What Does an AV Receiver Do? 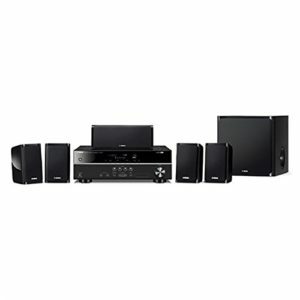 The AV receiver is what acts as the main component of a home theatre system. In fact, it can be considered to be the major component that helps you control and drive your home theatre system. Of course, we have been checking out a few great AV receivers in this post, but how about learning how exactly your AV receiver work? Basically, an AV receiver does have two functions – one; it amplifies the sound that is fed into your speaker system. Next, it lets you switch between the audio and video channels that would wish to watch or listen to. To put it in a layman’s words, an AV receiver will let you switch from a live TV program to a DVD or some other channel. Each of the audio sources on your home theatre will connect with your AV receiver. The control to the switching action between your different sources of audio is handled at the preamplifier section of your AV receiver. In the same manner, as the AV receiver connects your audio sources, it does help you connect with your video sources as well. This will help you simplify the selection of your video sources. You just need to choose the video source on the AV receiver remote, and there is nothing else you need to do. Compared to the traditional stereo receivers we have used since long, the newer AV receivers let you decode the analogue and digital formats of surround sound systems. The recent AV receivers have the ability to decode even Dolby TrueHD and DTS Master Audio formats. The AV receivers also come with a radio tuner. Most of the new generation AV receivers come with a satellite radio receivers. If you are sports freak or checking out the satellite exclusive content, you can check out the receivers that have the capability built within. If you are averse to paying the subscription fees for the satellite service, you can opt for the free services as well. It will provide you with an option to get an on-screen display for your TV. The AV receiver provides you with an option to commanding the electronic devices through your AV receiver. The AV receivers come with a minimum of five channels. The receiver amplifies the signals and drives the optimum degree of sound to your speakers. This can help you get an optimum amplification. Dolby ATMOS – This is one of the widely popular surround sound formats. The ATMOS part lets you add the third dimension of height to the sound. HDR – This refers to High Dynamic Range. Compared to the standard dynamic range, it introduces contrast and volume to your sound profile. 4K – A resolution higher than HD. This is quickly becoming the standard options on the newer TVs and video systems. DTS:X – This is yet another object based audio format. It is considered to be more flexible and wider than the Dolby ATMOS option. Bass – Bass frequencies are actually the low frequencies. The frequency lies below 150 Hz. Codec – This stands for COmpression/DECompression. This algorithm is used for storing the data in smaller packets to save space. A good codec will help you save the space without affecting the quality of the sound signals. That was all we have with respect to the best and top end AV receivers you can buy depending upon your exact requirements. The list is not exhaustive, but it should ideally help us initialise you into what you can expect from an AV receiver. Like we said when commencing this compilation, there are too many choices and options available when choosing a good quality AV receiver. The ones we have listed here are just a peek into the lot available. Have you used any of the AV receivers we have featured here? If you have, do share your thought and inputs with us so that our readers will benefit from your experiences. Recently, I was thinking of buying a AV receiver and this post came exactly on time. I devoured this article and it was really interesting and most important thing not boring for sure.